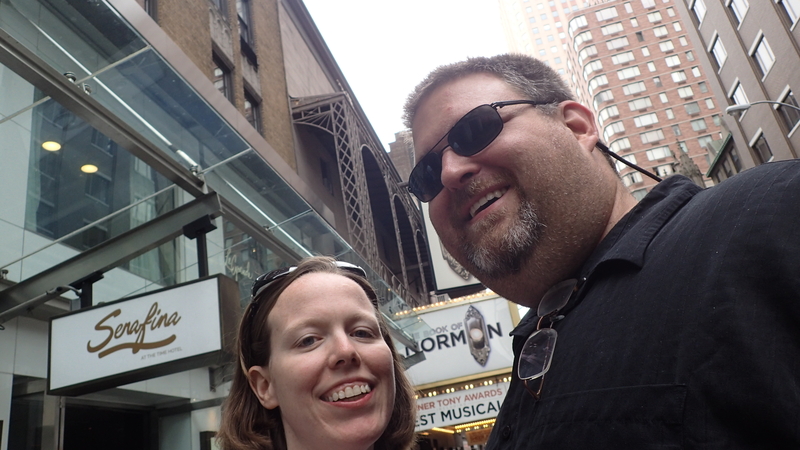 While planning our anniversary trip to New York, I knew that I wanted to see a Broadway show. However, I wasn’t quite sure how to get Eric on board to this excursion since he typically dislikes musicals (he took me to see a local performance of Rent a few years ago for my birthday and, bless his heart, as much as he tried, it just wasn’t his thing). 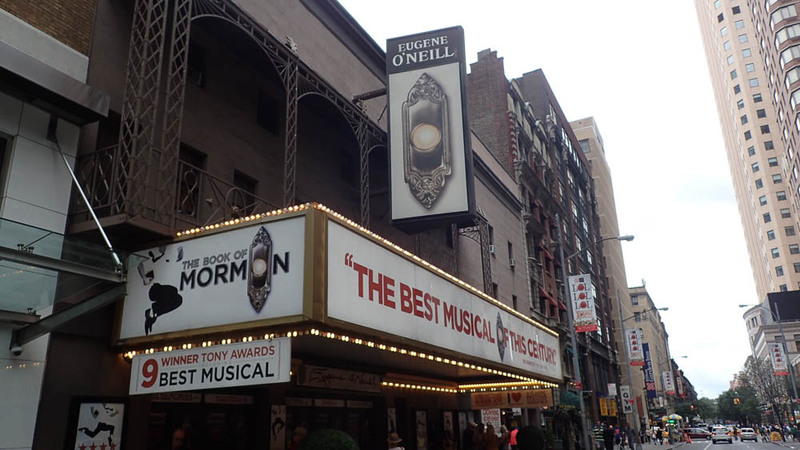 I did my research and came across a play that would fit both of our requirements: mine to check “See a Broadway show” off my bucket list, and something that would keep my doting husband entertained. Then we came across “The Book of Mormon.” Intrigued by the descriptions and reviews, we decided to purchase tickets since it was a comedy and wasn’t a sappy musical. The write-ups about this show did not do it justice. If you have ever watched “South Park” and thought that its creators couldn’t get any worse, you’d be wrong. WAY WRONG! They took no prisoners when it came the offensiveness. Hilarity ensued! After a couple of hours in Times Square, we made our way to the Eugene O’Neill Theater. Arriving early before the show, we decided to stop by the bar next door and have a drink. Tip: Visit Cielo at the Mayflower Hotel. It’s a cool little place with dollar bills attached to the walls. Without giving away any spoilers, the show about two Mormon boys being sent to Uganda had something to offend everyone. Honestly, I don’t know how they did it. However, by the end of the first act, I really had to use the ladies room, and knowing how those tend to be, I quickly ducked downstairs and rushed back as quickly as possible. I returned to our seats and Eric is doubled over in laughter. Dang it … I missed something, but by the roars of laughter upstairs, it was something good. During intermission, we headed out of the crowd and back to Cielo’s for another drink. As we took our seats for Act Two, we braced ourselves for what was to come. Sometime during the second act, we both got hungry, so we pulled out our leftover cheesecake slices from Junior’s with forks and laughed our way through the end.